Transparency Market Research has released a new market report titled “Nanocomposites Market - Global Industry Analysis, Size, Share, Growth, Trends and Forecast 2012 - 2018”. 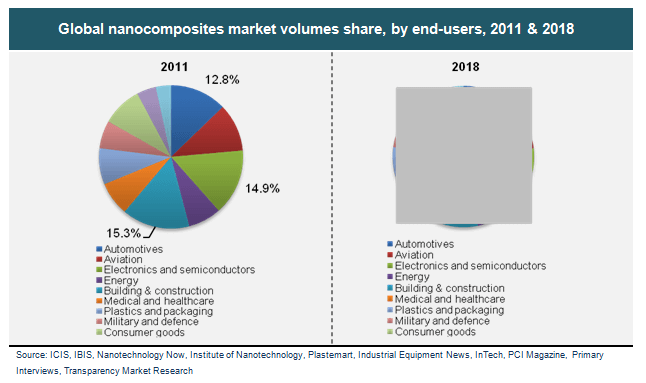 According to the report the demand for nanocomposites that was over USD 1.91 billion in 2011 is expected to increase to USD 5.91 billion by 2018, growing at a CAGR of 18.0% from 2012 to 2018. In terms of volume the global market for nanocomposites is expected to grow at a CAGR of 17.5% between 2012 and 2018. Their key role in vehicle safety and weight reduction is the major driving factor for the nanocomposite market, globally. There is also a marked rise in the application of nanocomposites in building & construction. The above two factors combined with a high volume of consumption in electronics & semiconductors have been driving the market for nanocomposites and increasing product sales. Their high cost in certain end-user industries and applications, however, is expected to be one of the factors holding back the market. Nanocomposites are made up of filler materials and surrounding matrix. The most commonly used filler materials are nanoclays (such as LAPONITE® and Montmorillonite) that have a huge demand worldwide. Nanoclays accounted for over 41% of the global market share by product segment in 2011. This product segment is expected to show a CAGR of 17.4% between 2012 and 2018. Glass fibers and metal fibers are also in huge demand and are expected to be major markets in the coming years. Other nanofibers, platelets, carbon nanotubes and graphene are also expected to show healthy growth over the forecast period. Medical & healthcare, plastics & packaging, military & defense, consumer goods, environment & water are some of the major end user industry segments where nanocomposites are used for a variety of applications.The automotive segment uses nanocomposites in the form of windshields, door paneling, headlight covers, etc. Nanocomposites are also majorly used in the aviation industry during the construction of aircraft and for replacement parts. Nanocomposites are used as bases for circuits, as conducting surfaces and other such high-end applications in electronics and semiconductors. In the energy segment, nanocomposites find numerous applications such as in blades of windmills, turbines and others. Building & construction was the largest market for nanocomposites in 2011 and accounted for over 15% of the total market share. It is expected to grow at a CAGR of 16.9% between 2012 and 2018. North America was the largest market for nanocomposites in 2011, accounting for approximately 40% of global demand. Building and construction, electronics & semiconductors and aviation were the major markets driving sales for nanocomposites in North America, making it the largest market by volumes. Europe accounted for a large portion of nanocomposite sales. Asia Pacific and RoW are expected to be strong future markets for nanocomposites with growing industrialization and infrastructure. Asia Pacific is expected to show the highest growth in demand and the market for nanocomposites is forecast to grow at a CAGR of 18.8% between 2012 and 2018. Transparency Market Research (TMR) is a global market intelligence company, providing global business information reports and services. Our exclusive blend of quantitative forecasting and trends analysis provides forward-looking insights for decision-makers. TMR’s experienced team of Analysts, Researchers, and Consultants, use proprietary data sources and various tools and techniques to gather and analyze information. Our data repository is continuously updated and revised by a team of research experts to always reflect the latest trends and information on the markets that we track. With a broad research and analysis capability, Transparency Market Research employs rigorous primary and secondary research techniques to develop distinctive data sets and research material for business reports.